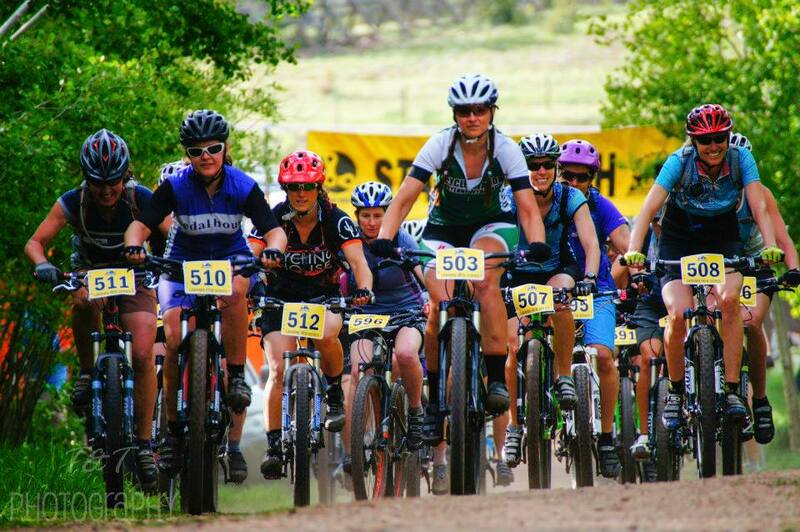 And once again, the time of year is here for the Laramie Mountain Bike Series! I did skip a couple of race reports because I didn’t have a whole lot to say, but I’ll tie up loose ends… I raced at the Wyoming State Games in Casper on June 15th. The race had been postponed to a day I didn’t work so I figured “why not?” and made the drive up! 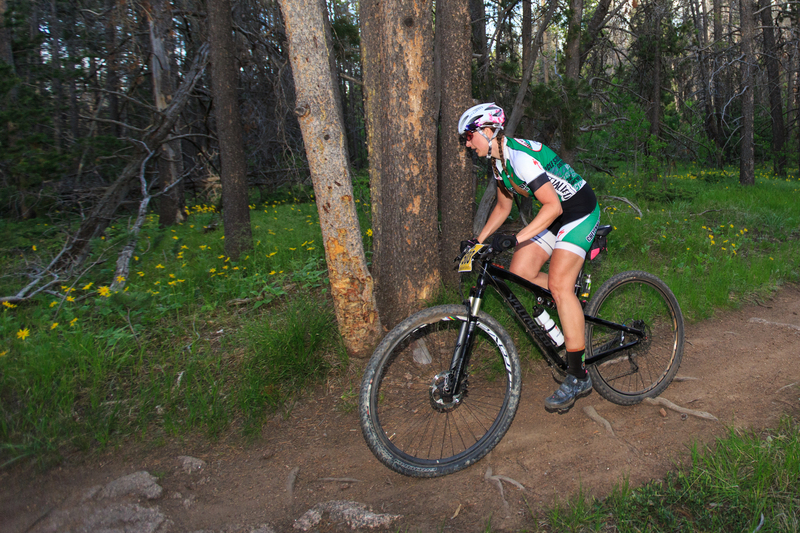 It was a low key race that took place on trails and single track at some parks in Casper. Very much a power course with one steep climb up an old paved road, and haulin’ descents. The other lady signed up for Expert Women seemingly didn’t race the whole expert race, so I rode the 15.7mile race pretty much to a solo win in Expert Women. Horrible 30mph headwinds going out, flying coming back on the loop. Not too bad of a race, I hope they can up participation numbers in future years! I did qualify for the 2015 State Games of America in Lincoln, NE, which is neat! It’ll definitely be something to keep in mind when planning next year’s race calendar. In between races I was riding one afternoon on the Cheyenne Greenway, heading home after a ride on some of the northern Cheyenne county roads where I was in a head on collision on a blind corner coming out of a tunnel. I was smacked off my road bike, and it banged up my left arm and hip pretty well. What the heck is up with this summer, and getting hurt?! Luckily the road bike made it out ok, except for a shifting issue that occurs only in one specific gear. It was just an unfortunate accident, and I just hope the other party involved learned to take it a little easier on those corners, or at least don’t ride down the wrong side. And I’ve learned to be scared as heck of the Greenway! 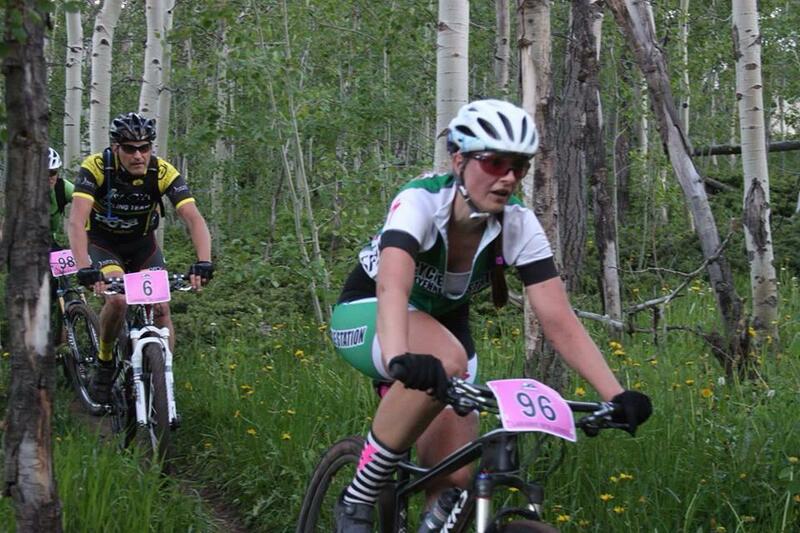 Which leads back to where it all began 2 years ago… race #2 in the Laramie Mountain Bike Series! I wasn’t feeling quite all ok the day of the race – I didn’t sleep or transition well from my 4 days on night shift leading up to it and was exhausted by the time early afternoon hit race day. The skies also didn’t look good, with raining starting in Cheyenne. Grudgingly, we made the journey over the hill to Happy Jack. I was on the fence about upgrading to Open Women, just for the longer miles and to just get to the point of “well, these are the fast girls, and this is the highest category, deal with it,” but was also hesitant about whether or not I was moving up way too soon, getting too eager just to be at the highest level. Even getting on the bike to go register I was still thinking, until I saw the all too familiar blue and white of a Luna kit! Georgia Gould came out to race at our humble local series!!!! I immediately said hi and blurted out some incomprehensible “OK, now I HAVE to race open because you’re here!” Like that makes sense? Super fast pro plus super slow me somehow equals racing open? I digress…. So I was stupidly giddy that I quickly rushed over to claim my pink number plate signifying I was in open. Jim and I set out to warm up and I think I said about 20 times “Georgia’s racing tonight!” Granted, she was racing open men, so not even in my class, but we all started at the same time, so for about all of 5 seconds I got to claim I was racing an Olympic medalist, as she quickly sped out of sight with all the fast men soon after that 5 second mark. 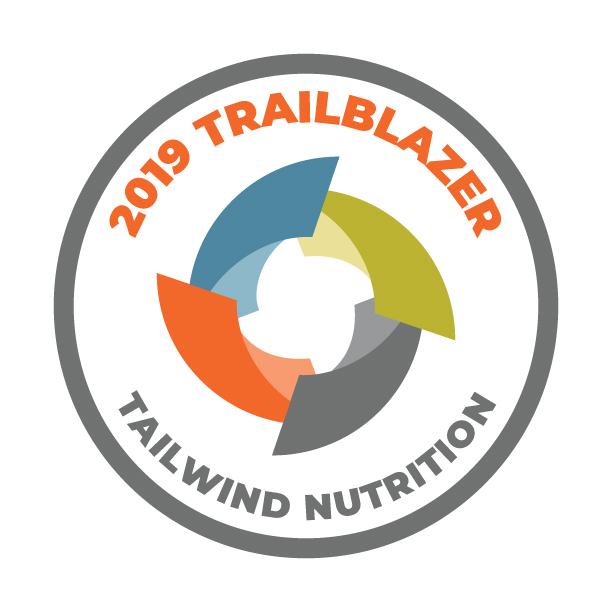 The course was 18 miles… two long loops of Meadow, UW loop, Lower UW, Middle Aspen, Aspen, Haunted Forest, Old Happy Jack Rd, Pole Creek, Blackjack, Adler, and the Bypass; follow by one short loop of Meadow, UW Loop, Lower UW, Blackjack, Adler, Bypass. The first long loop I had placed myself in 3rd out of us 4 gals racing through the beginning climbs and Lower UW. Doro caught me on Middle Aspen. She’s an insane descender and I was riding kinda conservatively (though I destroyed my PRs on Middle Aspen! ), so she sped off out of sight as I carefully picked my way through the deep ruts and eroded roots. We turned and begun to climb up Aspen which instantly made me think of Bear Creek in PA as it was muddy, moist, roots, and rocky! It was a tough, technical climb but I solidly made it up and got myself back on Doro’s rear wheel.. She quickly left me on the Haunted Forest descent, and I recaught her on the double track grind up to the start of Pole Creek. There were about 5 or so creek crossings – deep ones at that – that added to the fun of the night, and I’m happy I doused the Fate’s chain with WD40 Bike Wet Lube! By the time I hit Pole Creek I had distanced myself from Doro a bit, but I kept hammering. Travis and some of the guys of Rock On Wheels ended up behind me, and I somehow managed to jam my pedal into a stump which catapulted me up and then back, which rammed the nose of my seat into areas things should never be rammed into… all the guys collectively freaked out and hunched over I laughed that at least I was female! The guys got around me, but I continued on. I flew up Pole Creek, knocking about a 1 minute off my PR. The climb up Blackjack I bobbled which allowed Doro to come back into sight. She was on my rear wheel on Bypass when I managed to ride off the edge of the small skinny bridge, smacking into the cross tie which luckily my 29″ wheel rolled over, despite the impact. I gathered myself, and headed up through the start/finish. I had a 5 second lead! Second long lap started, and I managed to put Doro out of my sight on the climb, but she flew past me on Lower UW like I was standing still. That would be the last I would see of her 😦 On Middle Aspen my seat bag managed to rattle loose and was flopping around on one piece of velcro. The climb up Aspen didn’t go so well, and I ended up in a conga line of advanced men racers walking up it. I decided to finally stop and fix my seat bag, and continue on. My energy was sapped, and I realized I complete idiot for not bringing any nutrition with me. The difference between racing a typical 13-15 mile course and racing 18 miles was becoming very clear very fast. I suffered through Pole Creek and Blackjack and came through the start/finish to start my final short loop. My friend Nichole even commented that I didn’t look too happy as I came through the second time. It had started raining during my second loop, and during one of the creek crossings I had completely soaked my left foot so it was squishing every pedal stroke. My gloves where soaked. I can definitely say I wasn’t having a lot of fun. During the campground hill climb I caught Travis, who was also really suffering. I wasn’t expecting that to happen! The good thing is the moisture helped pack down the sand and dirt, and I felt faster on the descents (though Strava proved this wrong, haha). Once I got to the top of Upper UW I knew it was mostly descended back to the start which was good. All I wanted at this point was to not get lapped by Georgia, and so far that plan was working out! I came up the punch to the parking lot, and did a little sprint and crossed the finish line in 1 hour 49 minutes and change. I think that was a good 4-5 minutes off of Doro, and 12 off of Sara, who won on her single speed. I sat up in exhaustion and rolled through the finish with my hands off the bars (but NOT in the air, haha), which was the first time I’ve ever pulled that off. I was cooked! I quickly ran to change out of my soggy kit and gear, and enjoyed some adult beverages. The downside to racing the longer course is all the beef hamburgers were gone, so I had to have a veggie burger. Needless to say, black beans and I don’t get along so the beer and potato chips had to tie me over. Some do it for the cookies or the nookie, I do it for the pink number plate! Overall, I was pleased with this race. Sure, I’m totally not competitive in open women. Can I use the excuse I was racing beginner and sliding on my head a mere 2 years earlier?! But it went well and I don’t feel like it was a blow out where I was so off the back it was embarrassing, nor was I the last one off the course (and I even beat some advanced men who raced on the same course!). Had things gone better on the second lap on Aspen I think I could’ve had a smaller gap between Doro and I, and if I had brought a gel or some chews that definitely could’ve helped as well with the post-14 mile bonk. This is part of the reason I wanted to go to Open, as I need to get use to longer distances and times and get the kinks worked out now versus next year in my first Cat 1 races. The LMBS races are a great place to work out kinks it seems! Riding in the rain on soggy trails was also a good refresher on riding wet roots for Nationals which is coming up sooner than I was thinking! So in Open I shall remain, especially since I want a pink number plate, haha! Plus it’s kinda cool being amongst the Big Girls, and being in the top class! I’m glad I chose to ride my Specialized Fate this race, as the technical stuff was limited (unlike the week before which ran a lot chunkier course where the full suspension definitely helped on descents) and there was a lot of climbing involved. Just wish my Awesome Straps would hurry up and arrive so I can do away with that seat bag that likes to come un-Velcro’d on bumpy descents! Unfortunately I cannot make it to Race #3 as I have to work since I head out to Nationals later that week. But hopefully I am at the last 3 races of the LMBS! 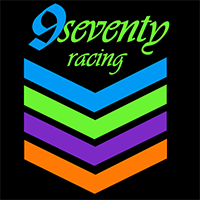 This weekend I’m racing at the US Cup in Colorado Springs, which will be an excruciating hot (95+ degrees) and long (19 miles) effort for hopefully a good result for USAC rankings. And then the pinnacle of my summer/season/year begins, and I turn east towards PA, with a pit stop to race in Iowa before returning to conquering the technical descents of Bear Creek, which I am going to FORCE myself to ride, dammit!